The Jollibee Foods Corporation will be opening their first branch in the province of Kalinga this coming February. According to various news reports, the branch will open on February 18 at barangay Bulanao in Tabuk City. A company representative also told the city's officials that the branch will be hiring up to 200 local residents as the new branch's workforce. The branch will be company-owned, not a franchise. It will have its business hours from 6:00 in the morning to 8:00 in the evening. Aside from the store's standard dining area, it will also have a drive-through section. The store will also be offering party services and catering services. According to a company representative, service crew members in the new branch will be paid a minimum daily wage of 290 pesos which is equivalent to 36.25 pesos per hour. Service crew members will be working for a maximum of eight hours in a day. "In 1975, Tony Tan Caktiong and his family opened a Magnolia Ice Cream parlor in Cubao, Quezon City which is credited as the first Jollibee outlet. The Magnolia outlets operated by Tan's family began offering hotmeals and sandwiches upon request from the customers which the family found out to be more popular than the franchise' ice cream. In 1978, the family decided to cancel the Magnolia franchise and converted the ice cream parlors they operated into fast food outlets. Management consultant Manuel C. Lumba advised the family of the move. The company that would be managing the chain of fast food, Jollibee Foods Corporation, was incorporated on January 1978. By the end of that year, there were 7 branches in Metro Manila. The first franchised outlet of Jollibee opened in Santa Cruz, Manila in 1979. 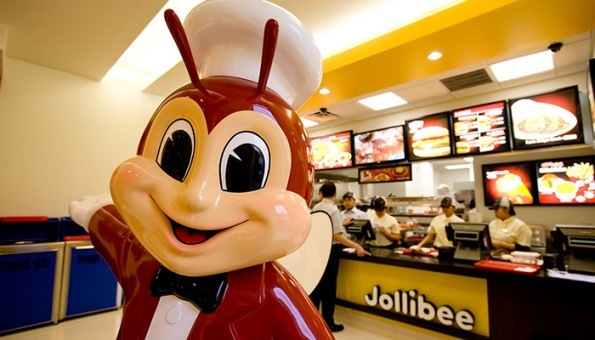 Jollibee experienced rapid growth. It was able to withstand the entry of McDonald's in the Philippines in 1981 by focusing on the specific tastes of the Filipino market, which differed from the American fast food company. The first Jollibee store overseas opened in Taiwan in 1986 which is now closed. Jollibee continued to expand and set up outlets both within the country and abroad."